Prince Alfred, the fourth child and second son of Queen Victoria and Albert of Saxe-Coburg-Gotha, the Prince Consort, was born at Windsor Castle and was second in the line of succession behind his elder brother, Albert Edward, Prince of Wales. Alfred was christened by the Archbishop of Canterbury, William Howley, at the Private Chapel in Windsor Castle on 6 September 1844. He was given the names Alfred Ernest Albert, although was always known to the family as "Affie". Alfred expressed a wish to join the navy and in accordance with this he passed the entrance examination in August 1858, and was appointed as midshipman in HMS Euryalus at the age of fourteen. On the abdication of King Otto of Greece, in 1862, Prince Alfred was selected to succeed him, but the British government blocked plans for him to ascend the Greek throne, largely due to the fact that the Queen strongly opposed the idea. He therefore remained in the navy, and was promoted to the rank of lieutenant on 24 February 1863, serving under Count Gleichen on HMS Racoon, and captain on 23 February 1866, being then appointed to the command of the frigate HMS Galatea. On 24 May 1866, Alfred was created Duke of Edinburgh and Earl of Ulster and Earl of Kent by his mother Queen Victoria. While in command of the Galatea, Alfred engaged on a voyage around the world. On 7 June 1867, he left Gibraltar, arriving at the Cape of Good Hope on 24 July and paid a royal visit to Cape Town on 24 August 1867. He embarked at Glenelg, in South Australia, on 31 October. Being the first member of the British royal family to visit the country, he was received with much enthusiasm. During his stay of nearly five months Alfred visited Adelaide, Melbourne, Sydney, Brisbane and Tasmania. On 12 March 1868, during his second visit to Sydney, the Duke of Edinburgh was invited by Sir William Manning, President of the Sydney Sailors' Home, to picnic at the beach front suburb of Clontarf to raise funds for the home. At the function an attempted assasination was carried out by Henry James O'Farrell, Alfred was shot in the back by a revolver, which wounded him just to the right of his spine. In the violent struggle, William Vial had managed to wrest the gun away from O'Farrell until bystanders came to his aid. Alfred married the Grand Duchess Maria Alexandrovna of Russia on 23 January 1874 at the Winter Palace, St Petersburg. 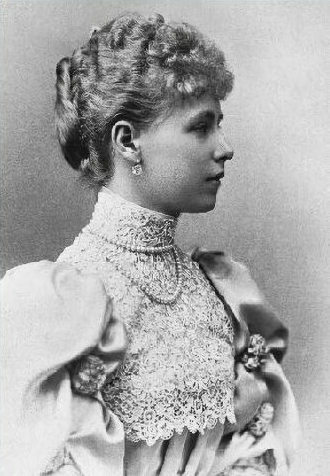 Maria Alexandrovna was the second and only surviving daughter of Emperor Alexander II of Russia and Marie of Hesse and by Rhine. The couple had been introduced to each other by Alexandra, the Princess of Wales and her sister Marie Feodorovna, Tsarina of Russia during a family holiday in Denmark in 1871. The marriage, however,did not turn out to be a happy one, Marie disliked life in England and its weather, she was considered haughty and proud. She resented the fact that that she had to yield precedence to Alexandra Princess of Wales , the wife of Alfred's elder brother Albert Edward and insisted on taking precedence before her, as she and her father the Russian Tsar considered the Princess of Wales' family inferior to their own. Queen Victoria however, stubbornly refused this demand. The couple's first child, a son, Prince Alfred of Edinburgh (Alfred Alexander William Ernest Albert) was born at Buckingham Palace on 15 October 1874, he was followed by a daughter Princess Marie Alexandra Victoria on 29 October 1875, known as 'Missy'. After turning down a proposal of marriage from her cousin, the future King George V, which both father's favoured, in 1892 the highly attractive Marie became the wife of Crown Prince Ferdinand of Romania, the heir apparent of King Carol I. Ferdinand and Marie became king and queen of Romania in 1914. A second daughter Princess Victoria Melita was born on 25 November 1876, so called as she was born in Malta, she was known as 'Ducky' in the family. Victoria Melita was married to her first cousin Ernest Louis, Grand Duke of Hesse, the son of Queen Victoria's second daughter Princess Alice in 1894, the marriage proved an unhappy one and ended in divorce in 1901, after which Victoria Meliita married another cousin. 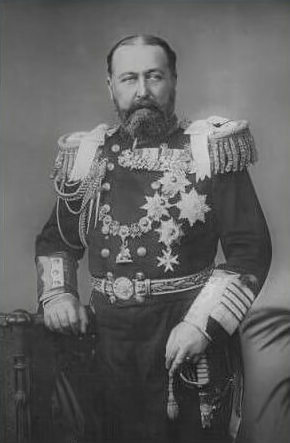 Grand Duke Cyril Vladimirovich of Russia. The marriage outraged Tsar Nicolas II and Victoria Melita's cousin, Tsarina Alexandra of Russia, Ernest Louis' sister. Cyril and Ducky were first cousins and the Russian Orthodox Church forbade marriages between suchclose relations. Alfred and Marie's fourth child Princess Alexandra arrived on 1 September 1878, nicknamed 'Sandra' in the family, she became the wife of Ernst II, Prince of Hohenlohe-Langenburg. The birth of a stillborn son on 13 October 1879, was followed by their last child, Princess Beatrice who was born on 20 April 1884. Beatrice joined the Spanish royal family when she married, on 15 July 1909, Don Alfonso, Infante of Spain, 3rd Duke of Galliera. On the death without an heir of his uncle, Prince Albert's elder brother, Ernest II, Duke of Saxe-Coburg and Gotha on 22 August 1893, Alfred inherited the duchy of Saxe-Coburg-Gotha, as his elder brother the Prince of Wales had renounced his right to the succession of the duchy. He was at first regarded as a "foreigner" in Germany, but gradually acquired popularity. 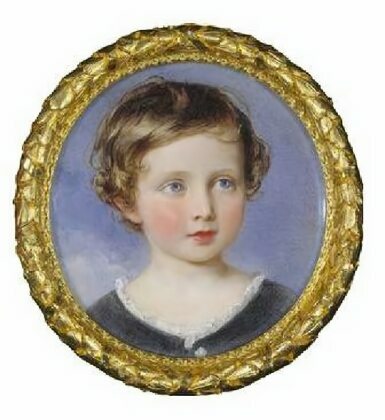 Alfred's only son, Prince Alfred, known as 'Young Affie' was engaged in to Princess Elsa Matilda Marie of Württemberg, one of the the twin daughters of Duke Wilhelm Eugene of Württemberg and his wife Grand Duchess Vera Constantinovna of Russia. Vera was a first cousin of Marie and the grand daughter of Tsar Nicolas I of Russia, but the marriage never occured. Alfred was suffering from syphilis and nervous depression. The young Alfred shot himself after an argument with his parents in January 1899, during their' twenty-fifth wedding anniversary celebrations at the Schloss Friedenstein in Gotha. Though severely wounded, he survived, but his mother, embarrassed by his actions, against the wishes of the doctors, sent him to Meran to recover. Alfred died two weeks later, on 6 February aged but twenty four. His death was officially recorded to have been caused by 'chronic cerebral affection.' His parents were devastated by his death. The Duchess of Edinburgh was said to have broken down and sank sobbing to her knees as Alfred's coffin was returned to Gotha. The Duke of Saxe-Coburg died of cancer of the throat on 30 July 1900 in a lodge adjacent to Schloss Rosenau, the ducal summer residence just north of Coburg. He was buried at the ducal family's mausoleum in the public Glockenburg Cemetery of Coburg. Alfred was succeeded as the Duke of Saxe-Coburg and Gotha by his nephew, Prince Charles Edward, Duke of Albany, the posthumous son of his youngest brother, Prince Leopold, Duke of Albany as Alfred's next brother, Arthur, Duke of Connaught, and his son, Prince Arthur of Connaught, had renounced their succession rights to the Duchy. Marie Duchess of Edinburgh survived her husband by twenty years.She died in October 1920 in Zürich, Switzerland, to where she had withdrawn to avoid post-war German hostility to Russians.